2016 has been a bit of a year, hasn’t it? Both on the public stage and for me privately, it has been a year of ups and downs, most of which have not made it onto the pages of this blog. Things You Don’t Say could have been the title, but then I might have hoodwinked myself into writing them down, so a more mundane, run-of-the-mill title it will have to be. So, looking back to last year, what did I hope for? and 2. Meeting up with the Tweeps. Well, that was a success. I can’t say that running my own show was a particularly pleasant experience, or one that I especially want to repeat, but meeting so many of my online friends has been a joy. Hopefully, I will be able to meet you all again this coming year – you never know. Give me plenty of notice and I’ll see what I can do. I hoped for health and it sort of happened. This year, just for a change, I haven’t worried so much about Sam as about my daughter, who has given me more than a few sleepless nights. We’re still here. That’s the main thing. Hmm. The least said about that the better. I have a couple of new pairs of trainers and that’s about it. I’m blaming my new job and my new routine that I haven’t quite got used to. I love it. R tells me that I bash the keys of my computer with such force that I am in danger of giving myself an RSI, but there we are. My book came out in May (I was too shy to organise myself a Launch Party, I can’t bear the social anxiety) and TES published another cover feature, this time about the role of the SENCO, which I hope will be another little contribution to change for the better. My doctor says that we are a memorable family. Looking after us takes a fair amount of adult effort, and, well, a lot of that effort is mine. Keeping everyone on an even keel as we set out on a year with big changes on the horizon is a low key hope. Drink less Diet Coke. I have started to become paranoid about my teeth and my bones. I need to look after me, and that means being sensible, doesn’t it? Read and learn. I had to give up on studying. I didn’t want to, but one thing and another conspired to make it just one more thing that I couldn’t do – but there no reason why I can’t read books, is there? After all, membership of a university library was the bit I most enjoyed the most. I have a stack of books waiting my attention, and, if I say that I will review them for work, I will force myself to actually read them, won’t I? I enjoy social media, but towards the end of this year it hasn’t been the easiest of places for me. I don’t feel silenced so much as bruised. Less time tweeting and more time spent with real people has got to be a good thing. Professional hopes. For a long time I haven’t had any of these. Having three kids, one of whom is disabled, makes pretentions to career ambitions the sort of thing that belong to other people. But my book came out in May. You never know, one day I might write another one. I write for Teach Primary, I have a bi-monthly column in TES that keeps me on my toes, and Driver Youth Trust gave me a job in September. I have given keynote speeches and delivered training. After four years of finding myself small, forgotten, squeezed in places to teach deeply underprivileged SEND children, I am actually starting to believe that I might have a bigger contribution to make, and I might actually be able to do it, as well as fulfilling my responsibilities at home. My heart still belongs to Down’s syndrome, and I will always find myself writing about it, and what it means to me, but I hope I can, as I have always done as a teacher, make a difference to more children than my own, to make the future a place for which it is possible to dream. I still struggle to believe in myself. It will take me a while to get over a long-lasting negative experience. I feel privileged to be working with people who not only seem to believe in me, but are kind. I seem to have found myself with a couple of spare moments and a handy computer to hand (or rather, that is what I am telling myself, I am resolutely ignoring the unmade beds waiting for me upstairs, they are airing; that is my story and I am sticking to it), so I thought I would (as you do if you are me) put my fingers to the keyboard and share a little of what we have learned about surviving Christmas. Think about reducing the number of communal events you attend. This is really difficult once you or your children hit the school system, but really, sitting in a cold church with a flushed and coughing child isn’t the way to get everyone into the festive spirit. You won’t get better, your child won’t recover and you will spread the germs about to someone else’s family. Be sensible. Christmas only comes once a year, it’s true, but it happens at the same time every year, so you know you’ll get another chance, all being well. Set your own expectations. It’s a bit like holidays with the children, really. If they are happy, everyone can be happy. There is an element to Christmas that is a bit like weddings; everyone has an opinion and everyone has a vested interest, but really, and especially if you don’t get much time off at Christmas, there is no reason why you shouldn’t have the day off that you want, or that your family needs. Make plans early. If having a Christmas day that works for you and your family means changing family traditions that have been set in stone since forever, start the conversation early, in, say, August. Adjust your expectations. Christmas can be a challenging time for everyone, and that’s before you add in special needs. Some things may well have to be left. Like family expectations, the trick (for me, anyway) is to think about the things that are really important to you and either keep them, or work towards them if your family members don’t feel the same way, and ditch the rest. Understanding that the ‘perfect Christmas’ – whatever that is – is mostly fake helps to keep everything in proportion. Keep calm. I know it sounds trite, but Christmas can be overwhelming for ordinary children; and even more so for those with a little something extra. Along with your expectations, keeping a lid on theirs can go some way to helping them get through the day without too many tears and tantrums. Go easy on the gluttony. Every year, at about half past eleven on Christmas Eve, I look at my sitting room floor and I feel a bit sick. I bought what I thought was a reasonable amount of presents – and so did everyone else. My boys taught me a lesson (that I continually fail to learn every year) when they were small and I placed a little tin of chocolates as a surprise for them on the end of their beds before they woke up. They were amazed and would have been perfectly happy with that and nothing else. There have been years, when they were small, when the whole gift giving thing was a bit much. Children learn what we teach them. It doesn’t have to be that way. I know it’s lovely to bless them with gifts, but you know, if they would rather everything was a little less exciting, why complain? The same goes for the food. You don’t have to eat – and neither do your kids – food that you and they don’t like, at a time that doesn’t suit you, just because it is the 25th December. I can’t promise that what has worked for me will work for you. Things like keeping it simple, letting people who have disabilities, or those who just feel like having a quiet time, celebrate the return of the light in the way they like, and finding a bit of room for my own needs works for me – and I am partly advantaged by my own preferences for quiet and calm. Your family, and your needs, will be different. I’ve been thinking of this post for a while, and, as the holidays are here, and, for the first time in a very long time, I haven’t got much else to do (well, I have, but I am womanfully ignoring it for the sake of my sanity) so here it is. The five songs of my youth that influenced me more than I thought at the time. And now I feel terribly old and terribly young at the same time, which is confusing. This last couple of weeks have been busy, and that’s just me. No wonder most of the teachers in the land are about to collapse into a sweaty heap, little squares of glitter stuck to their damp cheeks and foreheads, resisting a washing off for at least a week. The end of the winter term is almost as exhausting as the end of the summer, in terms of plays and performances, but without the sport or reports. So far this month I have been to one Christmas Fayre, one play, four carol services and one concert. It would have been two, but I had to go to work and it was supposed to be daddy’s turn only Sam was poorly and he ended up not going after all. I have heard all about it though. I have baked, written cards and bought wrapping paper for mysteriously hidden parcels, stood in post office queues and done battle with the printer. So far, so Christmas. I do not enjoy much of the preparations, I have to admit. There is too much rushing around for my liking, followed closely by too much standing about (I am usually late to things and have to squeeze in at the back). Too many things to get ready and fancy all at the same time. I gave up trying to produce the Perfect Christmas some time ago. I made my own Christmas Puddings three years in a row, and that was enough. I don’t mind making some mince pies (my mum lends me her Festive Pastry recipe) if I’ve got friends coming round, but really, muddling through in a relaxed manner (we have already ordered the chocolate log from the supermarket – I had a go at making one once, but honestly, it wasn’t much good and the shop one is miles better anyway) suits me fine. We decided as a collective that doing things our way (ie relaxing and generally not doing very much at all) was the way forward. But, you know, I am a contrary beast. There are some things about which I find myself alarmingly pedantic. The roasting of potatoes (45 minutes), the writing of Christmas cards (fountain pen), the singing of carols at the Correct Speed (not to fast, not so slow that a person runs out of breath at the wrong moment), the proper rehearsal of children in the school performance. Oh, OK. This post is entirely about that. Forgive me for amusing myself with a couple of flourishes before getting to the point. On the whole, the Christmas performances I have been to this year have been a delight. They have each been special, each in their own way, set against the backdrop of the splendour of a medieval abbey. Not many children or young people get to perform in such a place – my own are truly fortunate. It’s a pleasure to go and share the (somewhat chilly) time with them. But the one that really impressed me this year was not my daughter’s final primary carols. It wasn’t the secondary school, a fine celebration of the choral tradition. It was Sam’s. His last carols and the first ones out of his special special school and into the town. I wondered for how many children the experience of attending a service in such a large building was the first. I know it’s not for Sam. He has been going there since babyhood; he helped give out 400 oranges, stabbed with sweets and raisins at last years’ Christingle. He reduced the congregation to tears, and nearly the Bishop of Gloucester, with his-and-my prayer at harvest festival, which she had to read because we couldn’t. For some of them, the power of the organ, the unfamiliarity of the standing up and sitting down in the winter chill (despite the listed radiator churning in the corner), was a new one, and a challenging one at that. But what they did that day, when it ran like clockwork, when the talents of the students were showcased and celebrated, where prayers were clapped and everyone knew what to do and when and what would happen next, is they put those of us who do not give children the time to practice, who forget that while we adults do it every year and may very well be tired of the whole shebang that they are not, to shame. Rehearsing for the Christmas show, be it infant nativity, carols or panto, is never a waste of time. Showing our children what it takes to be good at something, what a good performance, what excellence, is, is never a waste of time. Those moments when we step off the timetable, when we come together as a community, to create the shared memory that binds us together as us are always worth the bother. When we continue the traditions that generation after generation remembers from their own school days, remembering that the little ones are empty pages, their stories as yet unwritten, we do something that goes beyond the utilitarian value of the measurable-on-the-spreadsheet education. So, I posted this thread on Twitter a while back, while I was waiting for my daughter to sing in a concert, and, well, I thought I’d reproduce it here. 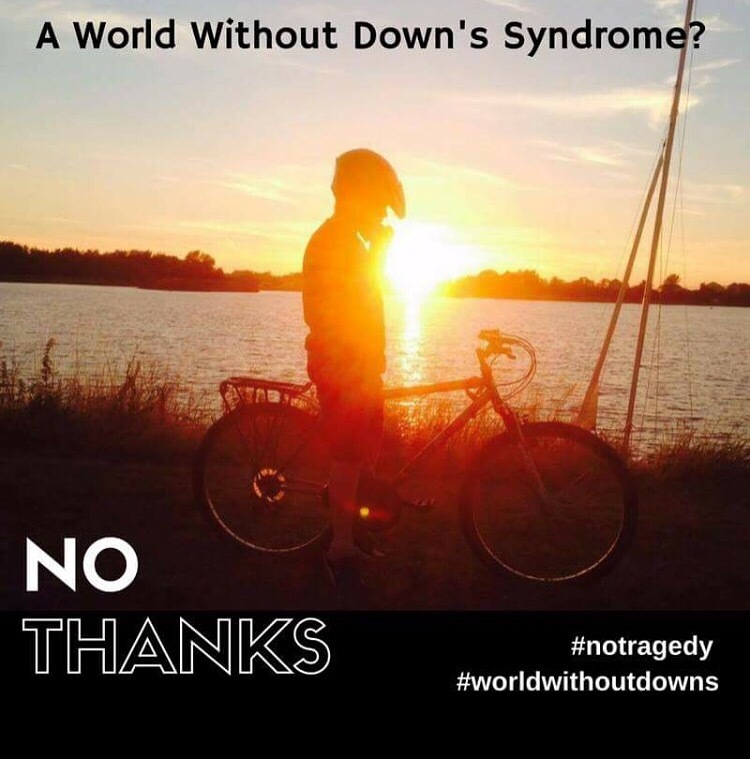 You see, the thing that upsets me I think most of all in this #worldwithoutdowns thing is the way that the problem seems to be all about the person with Down’s. My son isn’t a problem. He isn’t sick with it. He doesn’t suffer with it, and yet suffering seems to be the main reason why people decide that a baby carrying a little extra isn’t viable, and why they are advised to start again. And that’s when I start to get angry. I start to feel that rage inside that burns and makes me stamp my feet and cry that there IS an element of suffering – but that it’s ME when nobody helps me. When nobody draws alongside me and my son and asks us and asks us what we need so that we can join in the everyday things of life. He suffers when people laugh at him, or when they can’t seem to see beyond his disability enough to bend their own inflexible attitudes even just a little bit because that’s the way we’ve always done things here. And I don’t like living with sadness. I don’t like living with grief and loss – but the thing is, if I don’t I subscribe to the idea that we can wipe the tears away as if they had never been, doesn’t that mean that what I want is to live a plastic, a sanitised life? Doesn’t that mean I am afraid? That I am pretending to myself that life is not as it is? No, it’s not what I thought it was – but I wouldn’t be without it, not for the world. Because without the shadows, without the pain of loss or all those negative emotions that assault me regularly, would I ever know what joy was? A #worldwithoutdowns isn’t real. A #worldwithdowns is life. But, after having this post in my drafts for about a week, I think I had a deeper reason for getting it out and putting it here in its entirety. It’s because I have been thinking about selection. I’ve been busy with my new job (very exciting) and this has made me busily think about selective education. Our government wants to bring back selective education in the form of grammar schools, you see. Now, I am not alone in thinking this a bad idea. Given what I see in the community around me I don’t see schools open to the ‘brightest’ but the richest. I don’t see children who show everything they are capable of at 11 years old. I don’t see more choice; I see fear and worry and unseemly scrambling over the leftover schools when the selection has taken place. But more than that, I see a disturbing pattern. I see adults who seem to have forgotten that they, too, are human; that they, too, are subject to the whims of fortune, and that they can no more escape their messy reality, the pain and tears as well as the joy and laughter, as I can. Adults who think that they can somehow select the children they want, the perfect ones (or whatever constitutes perfect these days), and discard the rest, as someone else’s problem. We tell ourselves we can select for success, but at what cost? What price are we paying for pretending?